Ok.. now, when the top cover is removed, we are about to clean the contacts of the shutter. dirt developed over the time of frequent use. 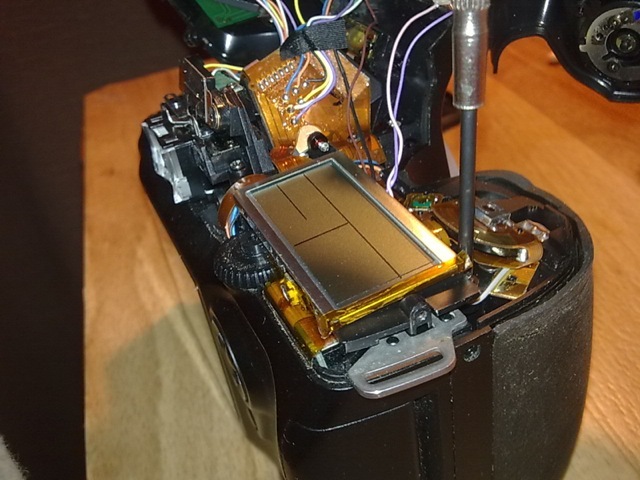 I have tried to remove also the bottom cover of the camera, but to access the dial button is very difficult and take more time, patience and skills. apparently, K100 and istDS are differently constructed, so thats why I was not able to find any other screws to remove. Anyway, ..if you have any photos that can be published regarding that dial button, I will be glad to present them to the other readers. Really very helpful Post. A step by Step Guide. Very useful. Thanks. That control wheel on the upper rear of my Pentax *istDS was balky; sometimes it would do nothing; other times it would actually function backwards when being turned forwards. I took off the top cover, and once I removed the screw holding the right side of the LCD panel as described, I was able to lift it enough to lift that control wheel so that I could put the squirt tube from a can of DeOxit® contact cleaner in there. 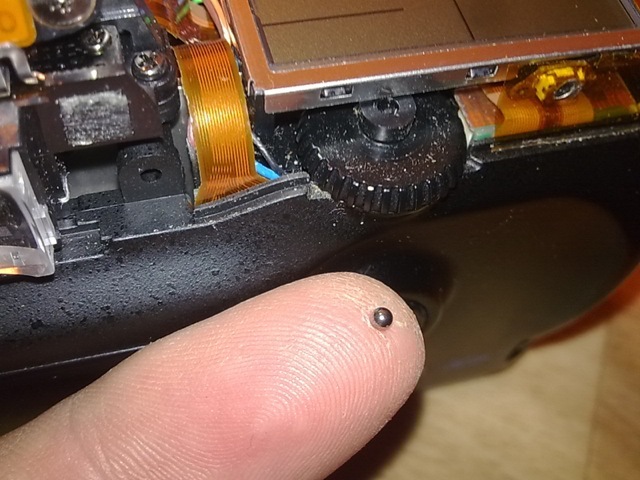 I could see the white plastic of the internal contact mechanism, and gave it a very light squirt. Actually I took the little squirt tube into my mouth, sucked up some of the DeOxit® which I had sprayed into a small bowl, and used my breath to deposit just a little of the DeOxit® onto that while plastic contact mechanism (using the squirt can probably would have deposited way too much). Then I ran the control wheel back and forth a few rotations. That fixed the operation of the dial. As a service to everyone who is here looking to service their Pentax *istDS, here is a link to a download of the SERVICE MANUAL in .pdf format. The file is PASSWORD PROTECTED but the password is included in the file name. Note that unless you are a paid member of Mediafire, you WILL get one or more pop ups when you attempt to download. Just close them. This is one .pdf file of just over 5mb. Just did this myself and it worked. Thanks for the photos. The link above to the manual is invaluable. To get to the second screw that holds the LCD screen in place you need to remove a ribbon wire, the only way to do this is to remove the back. To remove the back you need to remove the bottom, front and top! Its not hard just a little fiddly. Be careful when removing the back to not break the SD card door open sensor which is a spring loaded black button behind a silver holder in the top right of the rear PCB. 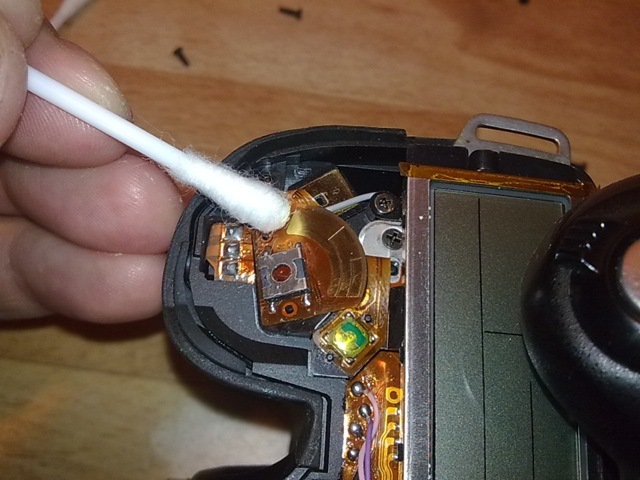 If you do break it, then make sure that it is pushed in permanently (a bit of blu-tack works well) and this will ensure the camera starts properly. If you notice the camera starts and then turns off a second later, this is the problem.